Blob Search Results - Datamaton Inc.
Part 3: this post – Customizing the search results display. The left pane shows all the storage locations that were searched. Locations that actually had search hits are shown as checked (selected). You can un-select and re-select a storage location to exclude or include its results in the display. Sliders at the bottom left corner show the range of dates and sizes of the content displayed in the search results. 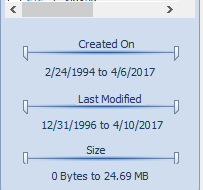 Change the position of these sliders to narrow down the display to a smaller range of dates and sizes. The top part of the right-hand pane shows the search that was conducted. The bottom part of the right-hand pane shows the search results. Different tabs show documents, photos, videos, emails, social media posts, appointments etc. Thus, you can go directly to the tab corresponding to the content type you’re searching for. You can sort the results shown in any tab by date, size, file/folder name etc. A small arrow next to the column name indicates how results are currently sorted. For example, the picture below shows results were sorted in decreasing order of “Last Modified” date. Therefore, you’ll see the newest content first in this results display. You can click on the column header text of any column to sort the results on that property. Click on the same column header again to change the order from “decreasing” to “increasing”. Each tab has its own search box at the top left corner of the actual results. The display will highlight and only show content that contains the text you type in this search box. This is handy if your search returns a lot of results and you want to find your content within a tab by searching for it. There’s a per-column “filter row” in each tab. This is the empty space just below the column header circled in red in the picture below. When you type something here, the results display will only show content that contains this text in that column. Each column has it’s own filter space and capability. 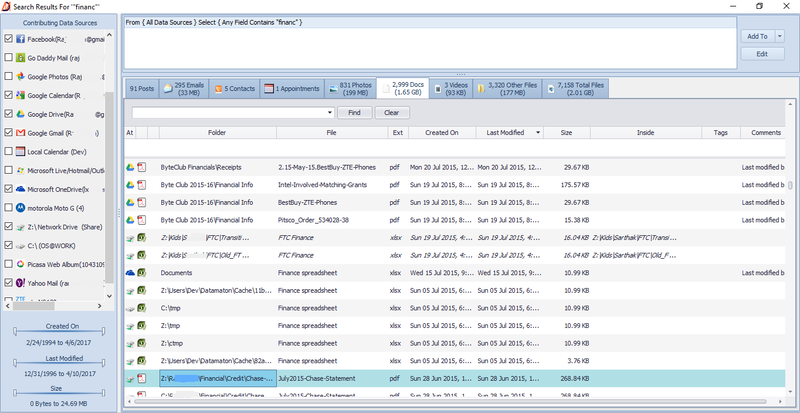 For example, you can type work in the file-name column and doc in the file-extension column. This will restrict the results display to only include files whose name contains the text work and whose file extension contains the text doc. The icon at the left end of each row shows the storage location where that content resides. Hover over this icon to see more details – for example the actual email address of the Google Mail account where the content resides. This helps you identify where the content resides, if you have multiple GMail accounts. 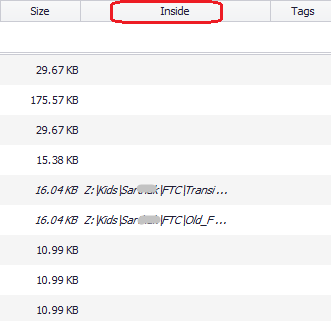 The “Inside” column shows information about the parent ZIP file or email within which it resides. There’s a “Add To” button at the top right corner of the screen. 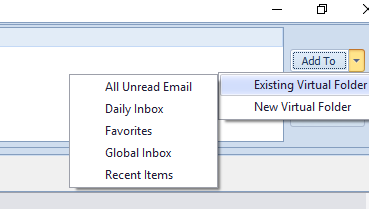 It lets you add this search to an existing Virtual Folder, or create a new one. As you can see, Blob lets you customize the search results window to further narrow down your search results.